Even if you can’t can’t run the Dev Preview, you can at least grab the new wallpaper and Messages beta and pretend to run the latest OS X. Developers can download the Developer Preview now, and OS X 10.8 Mountain Lion will be released this summer. White dwarfs are stars, not galaxies. Updated the post, but is the picture supposed to be of a white dwarf or a galaxy? I believe it is the same Andromeda galaxy from Lion just a different shot, maybe I am wrong. Can anyone identify the galaxy? Yes, it’s a somewhat airbrushed Andromeda. So basically techwatcher, you have no idea what you are talking about but act like you do. It looks like Messier 65 with the blue part of the spectrum emphasized. It is not Andromeda. There are too many details of Andromeda that just are not there. It is an incredible image though. The no of this galaxy is NGC 3190, 80 million light years away from us! Yes! Thanks! That’s fantastic. I’ve been looking and looking, how did you find it? Did you recognize it as an astronomer? In the Hickson 44 Group, located near the constellation Leo (the Lion). I think Apple graphics people did a fine job with this one. 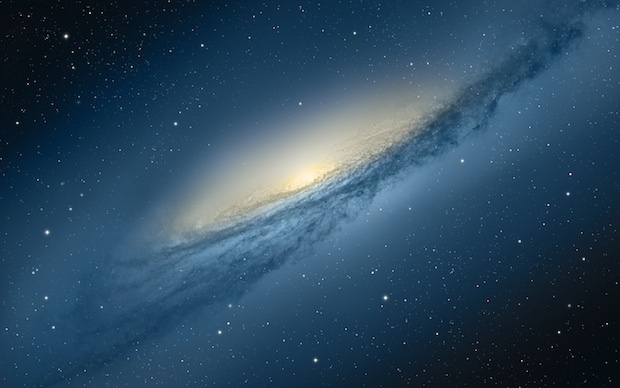 Best of the space themed Apple OS X desktop wallpapers, in my opinion.